A Mekong River cruise is one of life’s must-do travel experiences as far as we’re concerned and a languid three-day Mekong River Cruise to Luang Prabang on the Luang Say boat was the reason we’d flown from Bangkok to Chiang Rai and driven up to the Thai Border city of Houei Say. The Mekong River runs for a distance of some 4,909 km from the Tibetan plateau to the Mekong Delta where it flows into the South China Sea. 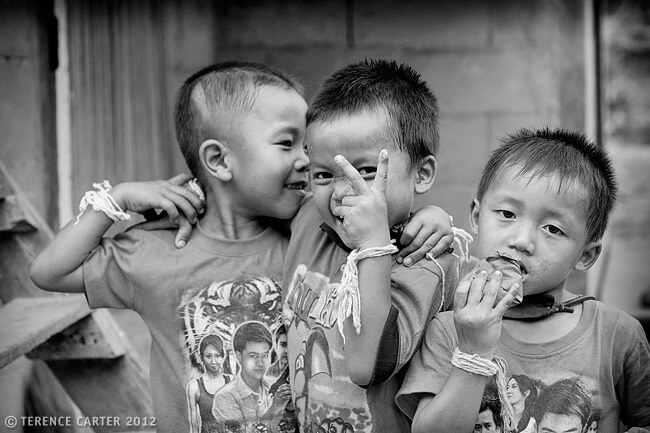 The Mekong region as a whole has a total population of almost 325 million, with approximately 60 million of those people living along the river. 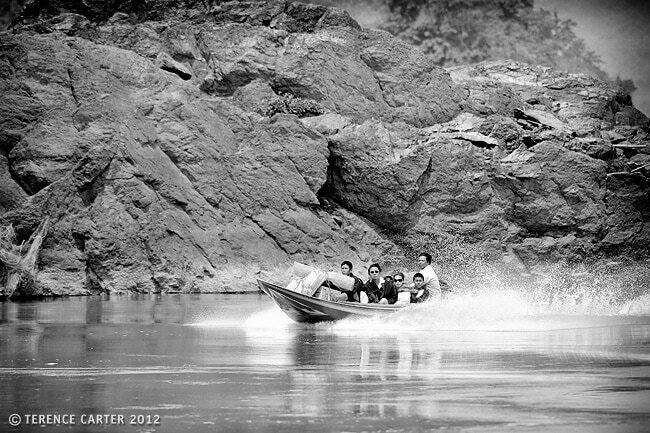 While speedboats bounce along the Mekong river for the 300 kilometre-long journey from the Thailand-Laos border at Chiang Khong-Houei Say (also known as Huay Xai) to Luang Prabang in Laos in an adrenaline-pumping six hours, we decided to travel the legendary river, where life otherwise carries on at a languid pace, in the only way that made sense to us: slowly on a Mekong River cruise, on the Luang Say boat. A driver collected us from Chiang Mai for the ninety-minute transfer to Chiang Khong on the Thailand side of the border to meet the Luang Say boat for our Mekong River cruise. 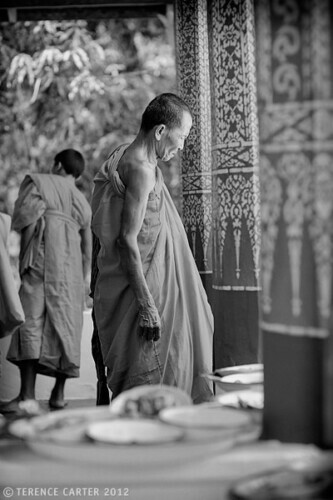 The early morning trip was a sleepy blur in between blinks of impressionistic roadside images — monks collecting their breakfasts from merit-makers, families whizzing along on motorbikes, Lanna-style wooden houses dotting lush fields. At the tiny Thai immigration office, there was a short line of the ubiquitous twenty-something travellers with their towering backpacks, looking like they might topple over at any minute, a world-weary French-New Yorker and her well-travelled teenage daughter with two colossal suitcases, and Terence and I with our carry-ons, one full of camera gear. 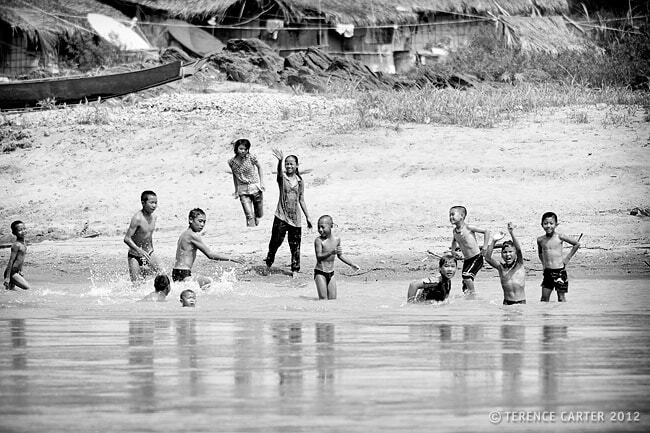 Cruising the Mekong River from Thailand to Laos. In less than ten minutes we had our passports stamped, the driver had deposited our bags on the longtail boat, and we were crossing the river for the five-minute trip from Chiang Khong in Thailand to Houei Say or Huay Xai in Laos where we were to board our Luang Say boat for our Mekong River cruise. Things went equally as smoothly, if perhaps a little more slowly, on the other side at Huay Xai where the Mekong River Cruises rep met us and escorted us to their office to complete the Laos immigration forms over coffee. At the adjoining immigration booth, I changed our Thai baht for Laos kip, paid US$30 each for our visas, and collected our passports within minutes. It was all too easy. 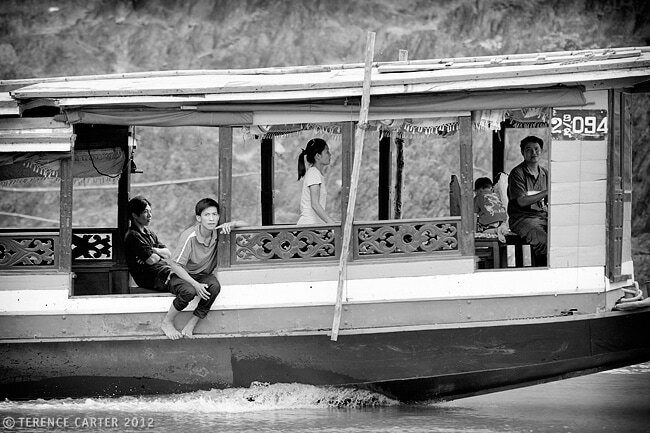 And then we took in the scene while we waited for the rest of the Mekong River Cruises’ Luang Say boat passengers to arrive. Petite Lao women in floral shirts, batik skirts and flip-flops sat on the steps filling out forms. Backpackers diligently read their Lonely Planet guides so there’d be no surprises. Hmong women in blue trousers and orange sashes, with big plastic garbage bags full of handicrafts, waited in line for the speedboat. Minutes later, we were hiking up the hill, and piling into songthaews (small shared taxi trucks) for the brief drive to the slow boat dock. There our posh teak and rosewood Luang Say boat waited for us, moored amongst squat wooden boats, gaudily-painted in vibrant shades of peppermint, royal blue and grass-green, with mail-box red trim, and flower pots and flags on bamboo poles decorating their bows. A renovated rice barge, with open sides, polished floorboards, and furnished with wicker sofas and chairs and coffee tables, the Luang Say boat was comfortable, if not luxurious. There were only a dozen passengers plus a handful of staff, so there was plenty of room to spread out. Terence and I got comfy on a sofa and seats, beneath the captain’s deck and a sign that said: ‘Please be careful boat can sway in the rapids’. We were welcomed with big bottles of iced water and glasses, and baskets of crunchy fried banana and sweet potato crisps. Our guide used a hand-drawn map to point out our route along the Mekong River to Luang Prabang. On the first day of our Mekong River cruise on the Luang Say boat we would stop at the Hmong village of Huay Hok Khong, arriving at Pakbeng for sunset and our overnight stay at Luang Say Lodge. 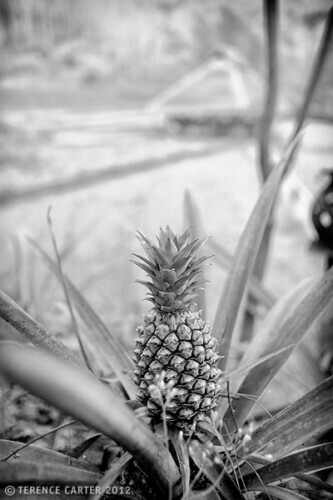 The second day we were to visit the weaving and whiskey-making village of Baw, home to Lao Loum people, and stay at Kamu Lodge, adjoining the Kamu village of Nyoy Hai. 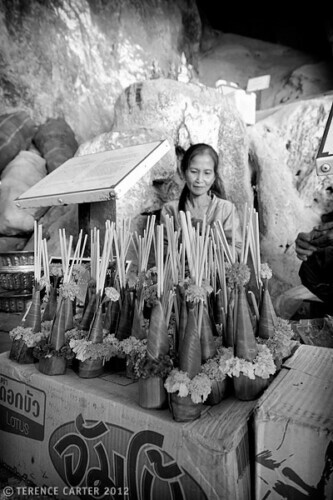 And on the final day we would visit the Pak Ou Caves with their thousands of Buddhas, before arriving in Luang Prabang. While our fellow passengers — from France mostly, as well as Spain and the USA — were quick to bury their noses in their Kindles and paperbacks, Terence and I found ourselves bouncing from one side of the boat to the other, photographing the scenery. For the entire length of the route, we would watch herds of buffalo, cattle, and even goats, taking dips, and sometimes snoozing, in the shallow waters at the river’s edge — a sensible idea, as it was sweltering. We watched farmers tending their crops of corn, growing in fenced off areas on the river’s sandy beaches, and chickens pecking around the shoreline. 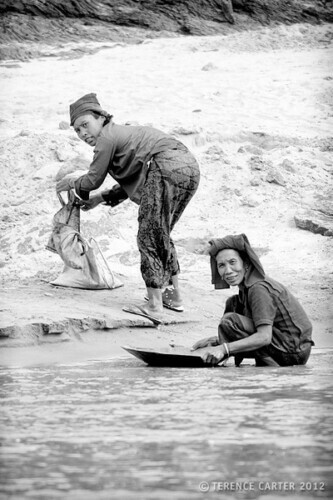 Women crouched in the water washing clothes or panning for gold. Children swam naked, splashing and tackling each other. 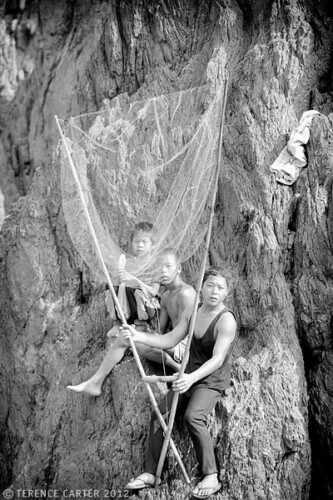 Men threw out a line from skinny wooden boats or checked their fishing nets that hung from tall poles. 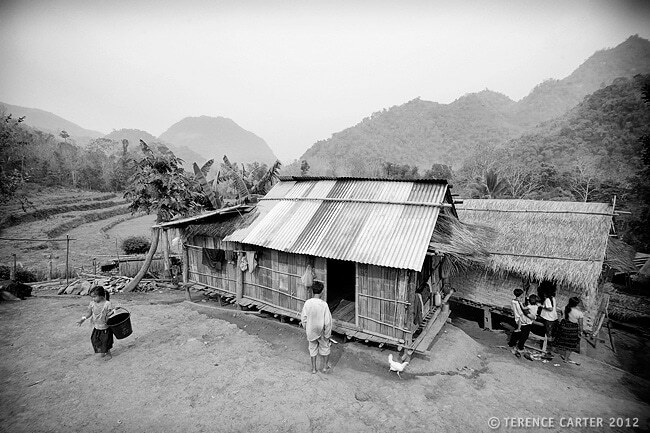 Villages of bamboo huts and ramshackle wooden houses on stilts, topped with palm fronds and corrugated iron roofs, poked above the trees. 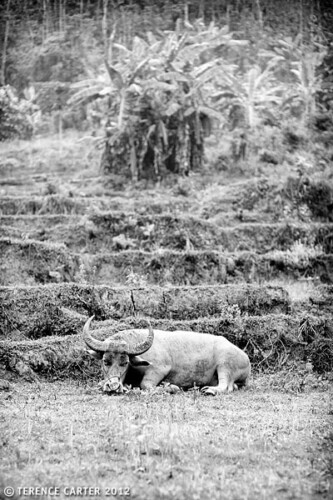 The vegetation varied from thick verdant jungle to gentle hills of barren farmland, from acres of lush banana plantations to dramatic limestone rock formations. 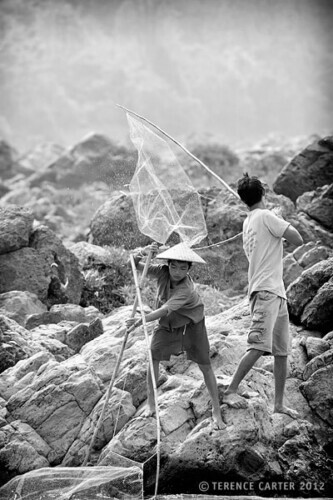 The Mekong was still mostly, with strong currents and whirlpools in places. At one spot our captain had to negotiate some rapids. 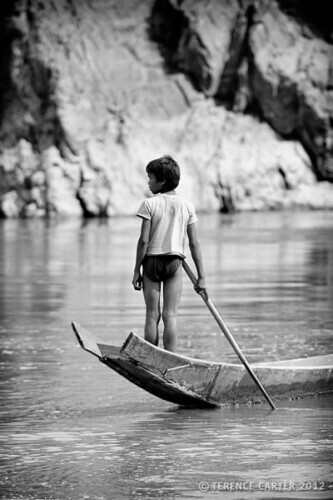 Fortunately, our little Luang Say boat didn’t ‘sway’. Every now and again, the peace and quiet of our Mekong River cruise was disrupted by a speedboat crammed with locals whizzing by, or one of the brightly-painted, budget slow boats, jam-packed with backpackers, with pushbikes and other bits of cargo scattered on their roofs. 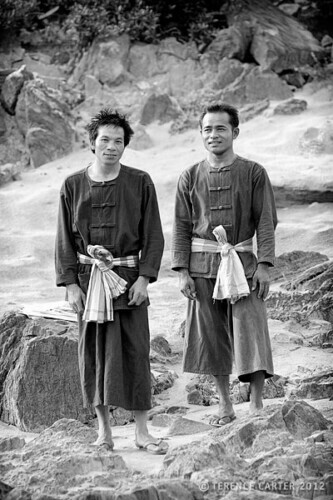 These periods of doing little at all on the Luang Say boat but taking in the scenery and taking photographs, were punctuated by meals — delicious buffet lunches of tasty Northern-style sausages, fish wrapped in banana leaves, hearty curries, and rice, and icy Beerlao — and sticky visits in the scorching heat to villages perched above the river banks. At tiny Huay Hok Khong, home to 300 people from 45 families of Hmong people, who are Animists rather than Buddhists, we visited a spirit house and learnt about animal sacrifices. In a darkened shop, a group of young men invited Terence to join them to share their plates of som tam. At Baw the next day, a village where the Lao Loum inhabitants make whiskey and weave textiles, we were unlucky to find there was no whiskey being made, but instead were fortunate to discover our visit coincided with village festivities to mark the monk’s blessing of a new temple being constructed. On a walk around hilly Nyoy Hai village, where 73 Kamu families farm rice, corn, sesame, and hops, we visited a shop selling bottles of potent whiskey with scorpions, centipedes, snakes, and even small turtles. 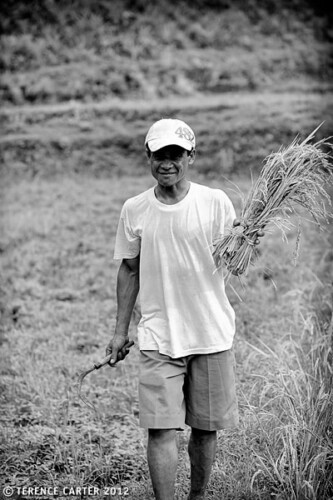 Of the 324 residents, 28 villagers work at adjoining Kamu Lodge, where after our walking tour, staff demonstrated how to plant and harvest rice, how to pan for gold, and how to cast a net to catch fish. Kamu Lodge didn’t possess the same level of luxury as the lovely Luang Say Lodge, where we’d stayed the previous night. 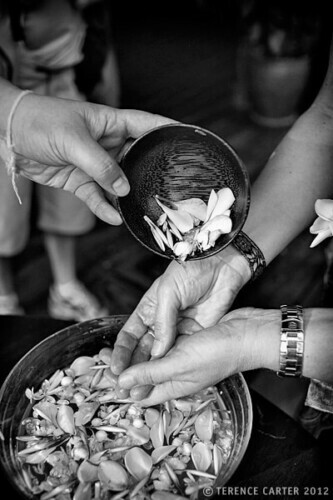 At Luang Say we were met at the boat by smiling porters who carried our bags up to the property, and upon arrival at the lodge we were greeted with cold bowls of water, fragrant with frangipanis and jasmine, that was poured over our hands, and lemongrass drinks that quickly quenched our thirst. There was no such welcome at Kamu. From the individual teakwood stilted houses that serve as guest accommodation, we had sublime Mekong River views through big louvered windows and more dramatic vistas from our private balcony that we savoured as we sipped cold Beerlaos and chilled white wine. In the bathroom there was a steaming hot shower and aromatic bathroom products. In the main room, a big comfy bed was covered in beautiful white linen, upon which frangipanis were scattered, and a mosquito net draped prettily. There was a colourful bowl of fresh tropical fruit on a table. Dinner, a set menu of way too much Lao food that covered our table, was superb: beef soup, pork larb, spring rolls, chicken curry, grilled beef, stir-fried vegetables, black sticky rice, and, for dessert, fried banana balls and fruit. Breakfast of sticky rice and mango, papaya, eggs, bacon, Laotian coffee, and lemongrass tea was almost as delicious. 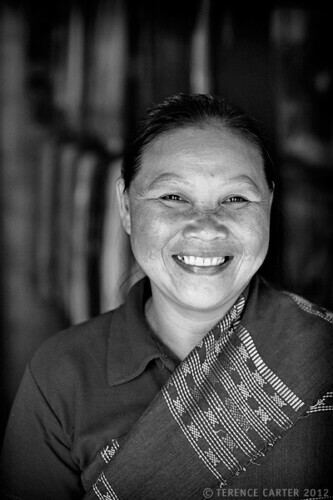 By contrast, Kamu Lodge, a responsible tourism project operated in conjunction with the Kamu people, has a little catching up to do. The setting is spectacular, however, with an alfresco bar and restaurant in separate bamboo-stilted structures situated on lush rice terraces, and permanent eco-tents dotting the edge of the property. When we stayed, these were in need of a little maintenance that may well have happened since — the basin in our sink had no taps, the bedspreads were stained and ripped, and there was no torch or umbrella, so we stumbled around in the darkness and the rain. The food was average, and it’s not often we say that in South East Asia. 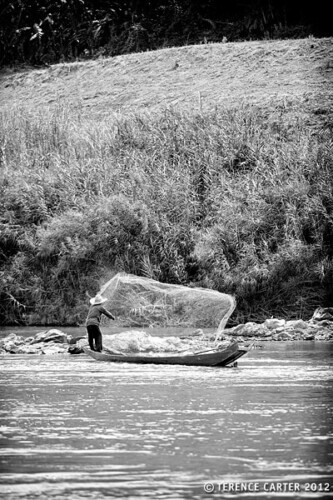 While we felt like we had got a good feel for the rhythm of life on the river after a few days on the Luang Say boat, in reality our Mekong River cruise gave us just a small glimpse into how people on the Mekong live their lives. A slow boat is the way to go as far as we’re concerned, and the Luang Say boat was wonderful, despite the minor disappointments with Kamu Lodge. 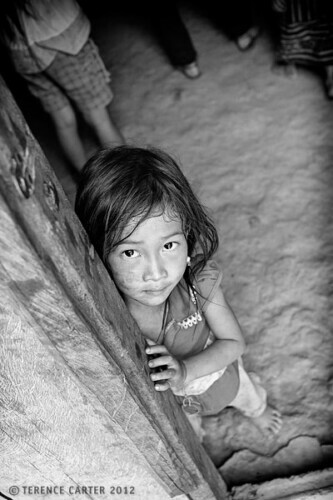 If anything, the trip made us eager to experience more of the Mekong. And in much the same way as we did. Nice and slow. As we like to say: next time. There’s always next time. Book The LuangSay Lodge & Cruise Mekong Cruise with our booking partner Booking.com. 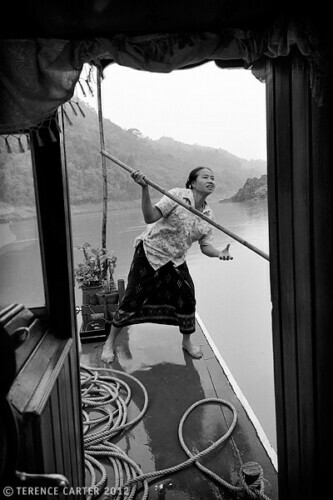 Click through to read our Guide to Mekong River Cruises and the slow boat versus the fast boat. 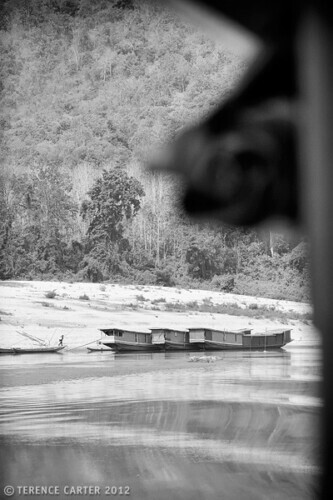 Have you done a Mekong River cruise from Thailand to Laos on the Luang Say boat or another boat? We’d love to hear about your experience. Love the idea of doing this slow cruise. We will be in LP in a few months and will have to look into this for a few days. Sounds like it was a great experience! We took the slow boat in 2008 and this post brings back memories! We got to the port by public transportation and took the cheapest local boat… sounds like a very different experience. Hi Marilyn – yes, it happens from time to time at various sections of the Mekong, in Cambodia too – you’d think these guys would be better at judging the water levels, wouldn’t you? They repair these boats pretty quickly so don’t think they’re ever out of action for long. Despite the heat, I really enjoyed it, though if I was to do it again it would be at a cooler time of year.